Ramadan is a time when Muslims fast, a time of reflection and, this year, a time when many Muslims believe there is a need to speak out against the worst mass shooting in U.S. history. "If you're a person of the faith and you have the love of our creator in your heart, and if your heart is full of love for your creator, there is no room for hate, there is no room for crime. These people are criminals. They use any reasons that they can give to achieve their goals," said Virginia resident Hussein Gul from his mosque in Falls Church. Muslims across the nation condemn the act of Omar Saddiqui Mateen, who authorities say pledged loyalty to Islamic State during his attack on a gay nightclub in Orlando. From Los Angeles to Washington, and everywhere in between, Muslims say the actions of the gunman do not reflect their Muslim beliefs. Ines Olevic Saleh, a Muslim American and refugee from Bosnia, says she hopes non-Muslim Americans understand the difference between the teachings of Islam and extremist beliefs. Muslim American attorney Jesse Sbaih, who unsuccessfully ran for U.S. Congress in Nevada, says people should not lump all Muslims together into one group. "I speak for myself and an entire community of American Muslims in this country, we are as shocked and as disappointed and as hurt as everyone else in this country," Sbaih said. In Orlando, Salaam Bhatti of the Ahmadiyya Muslim Community encouraged Muslims to reach out to the community to fight Islamaphobia. "We need to invite more people to our mosques. This is not a reason to lock our doors. The extremists want us to lock the doors to our mosques so we can drive people to their groups," Bhatti said. At a vigil in Washington, there was a message reaching out to Muslims who are gay. "The discourse needs to center [on] LGBT Muslims, give them a voice. 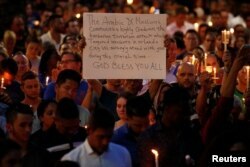 As an ally, all I can do is provide that platform," said Abiha Bilgrami, coordinator of the vigil. In Los Angeles, the Islamic Center of Southern California held a vigil on its front steps with a message to the violent extremists. "If you believe in God, you have to believe in human equality and defend the human dignity of every human being. We stand for that religion, not your exploitation or religion. ISIS, you are an abomination," said Salam Al-Marayati of the Muslim Public Affairs Council, using an acronym for Islamic State. He encouraged Muslim leaders to join leaders of other faiths in standing with the LGBT community and the belief in compassion and dignity of life for all people.